Students who struggle with reading comprehension need more opportunities to engage with content. Digital tools can personalize reading -- boosting the chances of students learning to read for enjoyment. 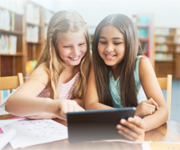 Download this SmartFocus on leveraging digital tools to improve reading comprehension. Do not let what you cannot do interfere with what you can do."